15ct antique regard ring from the 1890’s. Product code: ES3278 Categories: Sold Items, Sold Rings. Regard rings fall under the category of acrostic jewellery where the first letter of each gemstone spells out the word “Regard”. Regard rings were most popular during the Victorian era and were often given to loved ones and are so romantic and typical of this era. 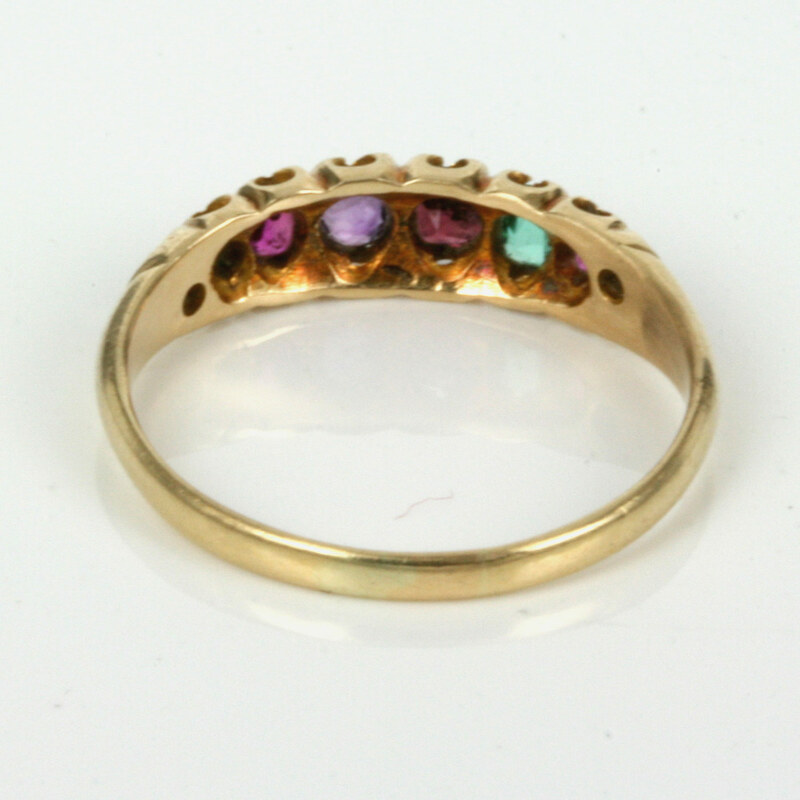 In this antique regard ring, there is a ruby, emerald, garnet, amethyst, ruby and a diamond which “spells” out the word regard. Made in 15ct gold, this regard ring also has a very sweet and unobtrusive scroll work on each side. From the ruby at one end to the diamond at the other, the ring measures 14mm across by 4.5mm wide and sits so well on the finger and will easily look good on its own or stacked against other antique rings. Victorian era antique regard rings are becoming increasingly hard to come by and this is a very simple and elegant version that will look marvelous on any finger and suit any occasion.